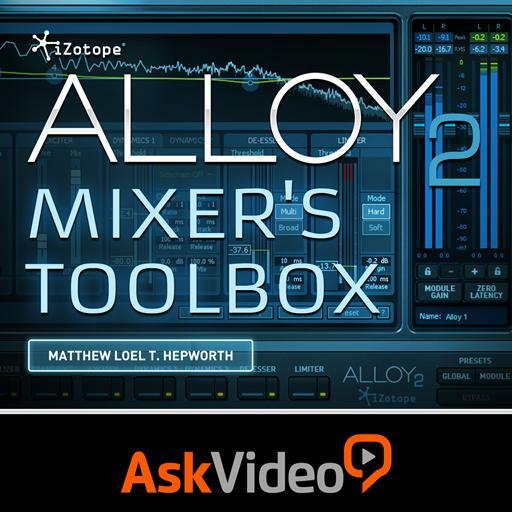 iZotope Alloy 2 - Mixer's Toolbox. To prevent the output level of Alloy 2 from exceeding a certain dB level, where should the Limiter be placed in the signal flow? In back of the Spectrum. In front of the Spectrum. Impossible. The Limiter module is always last. What button would you click to modify the signal flow of the modules? What does sidechaining allow you to do? Alter the signal flow through the modules. Always makes you sound like Skrillex. Trigger the Compressor Threshold from a different audio source. Trigger the Compressor Threshold from the Exciter output. What do the numbers shown above the EQ filters in the Spectrum indicate? Filter numbers 1 through 8. What does the Solo button in the Spectrum allow you to do? Melts the carbonite and releases Han Solo. Listen to the frequency range only. What are the four different types of processing in the Exciter? Analog, Digital, Vintage, and Transistor. Tube, Tape, Retro, and Warm. Agfa, Ampex, Scotch, and Valve. Not excited, Sorta' excited, Very excited, and Bliss. The sonic characteristics of Alloy 2 are not affected when Zero Latency mode is enabled. True, but only on PCs. True, but only on Macs. Module Presets can only be loaded in which view? Setting the Limiter to Soft ensures that the output of Alloy 2 never exceeds 0dB. How many frequency bands are programmable in the Multi-band mode?